Lent by the Yale University Library. Henry Marriott Paget's Lady of Shalott demonstrates the popularity of Alfred Tennyson's poem among those nineteenth-century artists who never achieved fame as illustrators but shared Pre-Raphaelite fascination with escapist themes of chivalric romance. Stories of heroic adventure in exotic lands naturally appealed to Paget, an artist and illustrator who traveled extensively throughout Italy, Greece, and Canada between 1879 and 1909 and resided in Constantinople in 1912, recording the events of the Balkan War for the Sphere. Although Paget's Lady of Shalott dates early in his career as an illustrator, it reveals the preference for romantic, adventurous tales and settings that characterize his later work. Tennyson's poem can be viewed as a romantic tale in which the heroine's love for a chivalric hero brings a fatal curse down upon her. Consequently, Paget illustrates the causative moment of climax when the Lady of Shalott runs to her window to catch a glimpse of Sir Lancelot, whose bedazzling splendor she cannot resist. In another moment the mirror will crack, and fate will seal her doom. Paget's depiction includes the essential elements of the poem, yet he places the mirror so that it could never reflect events occurring outside the window. Furthermore, the Lady seems to step out excitedly from behind the loom, implying that she turned her back toward the mirror as she wove, a direct contradiction of the poem that essentially denies Tennyson's conception of artistic creativity. Paget's addition of a cushioned window seat makes the temptation to gaze upon Camelot irresistible and the Lady's downfall perfectly understandable. In other words, by creating an environment in which the Lady of Shalott cannot possibly fulfill her mission, Paget thereby renders her unable to make the choice between spirit and body that matters so much to Holman Hunt. Such distortion betrays the artist's carelessness rather than any independent analysis of the original poem. 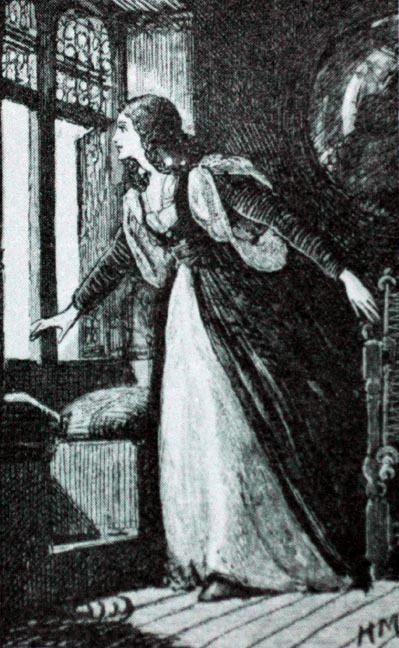 Inelegant or carelessly drawn lines and shading that remains surface pattern characterize parts of Paget's design, which exemplifies the deplorable state of post-1870s English book illustration. Paget refined his style as his career progressed and, though never brilliant, attained competence. By 1890, in his series of representations for "The Wonderful Adventures of Phra the Phoenician" that appeared from July to December 1890 in the Illustrated London News, Paget displayed greater faithfulness to his text and a more careful, if mechanical, use of line. Eastern religion and the idea of reincarnation inform the story in which the hero lives .ind dies several times, always retaining his individual characteristics while conforming to his new environment. Like "The Lady of Shalott," "Phra" is in part an escapist romantic adventure. As in his Lady of Shalott, Paget tries to make his characters appear medieval or exotic by adding specific costumes or facial features to a formulized figure type. His portrayals of women are more stylized than those of men, and Paget's female type changes little between 1881 and 1890. The Lady of Shalott, leaning slightly forward with her arms spread out at her sides, reappears in the seventh episode of "Phra" as Editha, now depicted in three-quarter view instead of in profile. Once Paget had developed a repertoire of poses and types, he reused figures and adapted them to their new situations by altering their hair, costumes, and compositional arrangements. Blackburn, Henry. The Art of Illustration. London: W. H. Alien, 1894. Fogelman, Peggy A. Ladies of Shalott: A Victorian Masterpiece and its Contexts, Ed. George P. Landow. Brown University: 1985. p. 136. Houfe, Simon. The Dictionary of British Book Illustrators and Caricaturists 1800-1914. Woodbridge, Suffolk: Baron Publishing, 1978. Tennyson, Alfred. The Works. London: C. Kegan Paul and Co., 1881.